Arielle Shipe has a message for anyone looking to embrace an adventure lifestyle without going full-on nomad: You don’t have to live in a van full time to enjoy the van life. Shipe, 27, wanted to dedicate more time to exploring nature but also needed to maintain roots in Aspen, Colo. Those roots — part-time yoga instructor, full-time health and wellness blogger — were too important to leave behind. And jumping into full-time van life seemed too drastic. She found the perfect answer in a pre-owned 2015 Ford Transit Connect, a versatile small van with strong fuel economy. Even better, you never have to make reservations. After Shipe bought the Transit Connect she set about converting it for her needs. The van has space enough for living quarters with room to store food, clothing and sporting equipment. It’s also much easier to drive than a large van. “The main thing was I wanted to feel comfortable driving it,” she said. “It made a lot of sense to get something smaller with better gas mileage. In the seven months since she bought the van, nicknamed “Ophelia,” Shipe and boyfriend Sam Ferguson, 29, have taken several excursions across the American West. With Yellowstone, Glacier and Grand Teton national parks already under their belts, they’ve set sights on exploring the California coastline. The van enables them to camp in remote places that other travelers can’t reach. No matter where they go, the gear comes along. They’re passionate about hiking, camping, rock climbing, stand-up paddleboarding and almost any outdoor activity. On a recent visit to Grand Lake, Colo., Ferguson fished from the shore and Shipe went for a bike ride. The van is fitted with a Yakima SkyRise cargo box on the roof, which carries camping gear, bike helmets and other small essentials. A hitch-mounted rack, the Yakima SwingDaddy, hauls their Giant and Specialized mountain bikes. The rack swings out to allow access to the rear doors. Undersized by typical adventure van standards, the Transit Connect feels much larger once Shipe opens its dual sliding doors and steps inside. It’s easy on the eyes too, as a soothing gray cloth lines the interior walls and ceiling accompanied by the soft glow of LED dome lights. Because the Transit didn’t roll off the lot with these upgrades, Shipe enlisted Jason Schirato at Aspen Custom Vans for help. Along with the cloth lining and LED lighting, Schirato also added a rooftop fan, rear windows for better visibility, custom door panels and a smartphone charging station. Lying flat behind the two front seats is a queen-sized bed setup. It consists of two side-by-side foam mattresses lying atop wood planks that fit neatly into ridges that elevate it off the floor. For added storage, the platform lifts to uncover a series of storage bins. Shipe keeps an extra car battery, first aid kit, some camera equipment and perishable food here. She’s also able to lift the platform off completely to create space for a modular desk. After screwing in a few metal supports into the exposed floor, the platform rests on top to form an on-the-go workstation. There’s even a drawer under the bed platform that runs nearly the length of the van’s cargo space. Shipe pulls it out to extend about 8 feet from the rear bumper. Inside, a portable Coleman stove sits on top with a small notch to place a propane tank. Shipe sets a cutting board on the makeshift kitchen counter to show how she and Ferguson prepare meals. Shipe’s hitch-mounted Swingdaddy Yakima bike rack gives her easy access to the back doors of the van where her kitchenette and mini-pantry are stowed. The sleeping area of the van doubles as a surface where Shipe can work from anywhere. Shipe’s van gives her exclusive access to remote trailheads, so having quick access to her bike is a essential. Back inside, handsome wood cabinets attach to the wall above the bed, creating a somewhat rustic aesthetic. The entirety of the van’s woodwork was done by Dan Quinn, a local carpenter Shipe met after striking up a conversation at an art gallery. Conversions like these are growing in popularity. 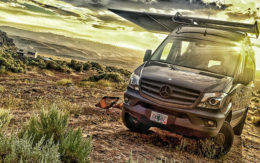 Adventurers increasingly turn to custom vans as the go-to vehicle for pursuing their outdoor passions. However most of the interest surrounds large vans such as the Ford Transit, Ram ProMaster and Nissan NV. The largest van life culture belongs to the Mercedes-Benz Sprinter. It’s used for a wide variety of commercial businesses, as well as mobile surf stations and by ski-country explorers. A host of van conversion companies specialize in outfitting Sprinters. But small vans like the Transit Connect are also well-suited for adventure. Though not as spacious as their larger siblings, compact vans offer greater driving comfort and fuel efficiency while still providing room for living off the grid. Shipe points out that there’s a perception that serious adventurers only live out of large vans full time. But that isn’t an option for her and Ferguson at the moment. Ophelia offers the couple flexibility on their trips. If they pull into a crowded campground at night, they can just venture off to find a better spot. They’re able to wake up early to chase the sunrise, head to the water for a day of paddleboarding or to the mountains for biking. Shipe and Ferguson have already discussed upgrading to a larger vehicle and giving the full-time van lifestyle an honest try. To them, more space would come in handy on longer drives to Canada or the California coast. In the meantime, Ophelia is the right combination of size and convenience. Most importantly, the van makes the outdoors accessible. “It doesn’t have to look a certain way,” Shipe said.